Thanat Thanawatcharanon, also know as Tom Dundee, 58, was a celebrity in Thailand for over a decade as a singer in the band Zu Zu. In 2010, he gave up doing concerts to become a leader of the Red Shirts (or United Front for Democracy Against Dictatorship), giving speeches at rallies. During this time, he was denounced by royalist watchdogs (the Network of Volunteer Citizens to Protect the Monarchy) for insulting the monarchy in some of these speeches. The Thai constitution states that “The King shall be enthroned in a position of revered worship and shall not be violated. No person shall expose the King to any sort of accusation or action.” Section 112 of Thai Criminal Code states: “Whoever defames, insults or threatens the King, the Queen, the Heir-apparent or the Regent, shall be punished with imprisonment of three to fifteen years.” We do not actually know what Tom Dundee or Thanat Thanawatcharanon said to cause the lese majesty accusation, because the alleged insults cannot be repeated. Thanat’s case dragged out until after the May 2014 coup led by Prayut Chan-ocha. Sentences for royal insults have become increasingly harsh under the junta, which justifies itself as protector of the monarchy. 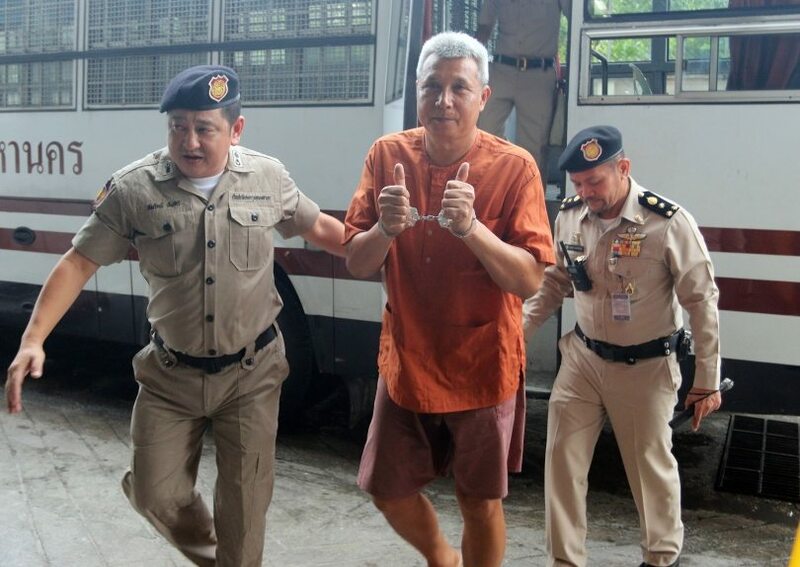 Thanat Thanawatcharanon a first he denied he was guilty of lese majesty, but after 11 months he confessed, as most lese majesty prisoners do in hope of receiving a pardon or a lenient sentence. However, on June 1, 2016, he was given a sentence was 7.5 years. In addition, the royalist judge added that after he is released, he must compose a song promoting national reconciliation and plant trees in honor of the king. On July 11, 2016, he was punished again for the same statements, when he was sentenced to several additional years under the Computer Crimes Act, which came into play because his speeches had been posted online. This brings the total time he will be imprisoned to 10 years, 10 months. He remains in jail separated from his wife and family. He can be pardoned by the King. For more information on this case, please see the Thai Alliance for Human Rights.